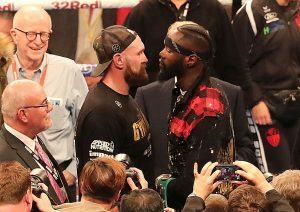 Tyson Fury’s love of a sing-song is legendary and the burly balladeer’s press-conference preference for a spot of Chris Stapleton’s ‘Tennessee Whiskey’ has seen the ditty installed as 8/1 favourite to be the first song he sings in the ring upon the conclusion of his clash with Deontay Wilder. The lineal heavyweight champion of the word has plenty of form for serenading both his wife Paris and the fight-night crowds from between the ropes upon the victorious conclusions of past battles. Aerosmith’s ‘I Don’t Want To Miss A Thing’ was the tune of choice after Fury’s career-defining triumph over Wladimir Klitschko in Dusseldorf, while he celebrated dispatching Christian Hammer with a rendition of Elvis Presley’s ‘Walking in Memphis’. The William Hill traders have priced up a veritable jukebox’s worth of jams Fury may deliver from inside the Staples Center ropes, with Frank Sinatra’s ‘My Way’ second in the betting at 10/1, ahead of ‘Because I Got High’ by Afroman (12/1) and Lynyrd Skynyrd’s ‘Sweet Home Alabama’ at 14/1. However, the Gypsy King’s pre-fight press calls have been all about country ballad ‘Tennessee Whiskey’ and a brief perusal of the lyrics makes it easy to see why. Fury’s well-documented issues with drink and drugs in the years following his career-high watermark against Klitschko the younger are behind him now and, in this context, the C&W tune sounds equal parts love-song to his wife (so often the focal point of his post-match singing) and boxing itself. Could the pitter patter of tiny feet influence song selection? While a quick blast of ‘Mama Said Knock You Out’ (33/1) by Queens rapper LL Cool J, seems unlikely, baby-related songs could well be on the Manchester-born fighter’s mind with his fifth child on the way in the New Year. If you’ve sussed a newborn-related tune that you can’t see priced up, tweet @WilliamHill with the #YourOdds and our traders will price it up for you. The latest Wilder vs Fury betting odds have the WBC champion 8/13 favourite in the bout betting, with the Gypsy King 11/8 underdog to regain a world title just three fights into his comeback. Don’t have a William Hill account? Click here to sign up using the promo code C30 and stake £10 to receive three £10 free bets.